Rice for dessert? Not the first thing that comes to mind. But come mango season this is one of my very FAVORITE desserts. 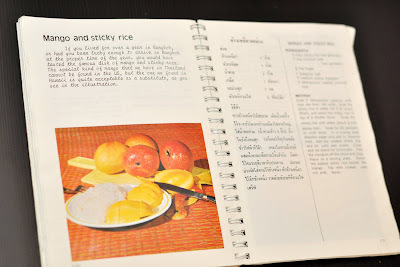 Mangoes with coconut sticky rice. This one doesn't happen to be Chinese, but is in fact Thai. It was only in the last 10-15 years that I first tried this dessert. I guess that makes sense since it was only in those years that I got into Thai food! (That whole idea of "you are what you eat" really rang true with us since we were brought up on Chinese and American food and that's about IT!) These days I can't leave a Thai restaurant without purchasing an order of this yumminess - even though I can easily make it at home! If you aren't familiar with coconut milk you should be. It's a wonderful buttery, slightly sweet milk with a faint coconut flavor that I swear you'd enjoy even if you don't like flaked coconut (yuck). 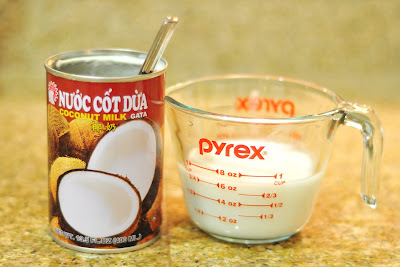 Coconut milk is usually the primary liquid in curries, both Indian and Thai. I'm pretty particular with my mangoes. My favorite are what I've always heard to be called Filipino mangoes, as opposed to red mangoes. 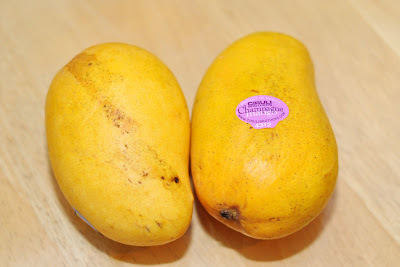 The brand in particular I always see locally are the Champagne mangoes (which are this same "Filipino mango" I'm talking about). They're sweeter and softer than the red mangoes. I don't see a lot of them at mainstream grocery stores like Safeway but do occasionally/seasonally see them at Costco, Trader Joe's, Whole Foods... And always at Asian grocery stores. maybe you do; I guess I don't know. Ha! 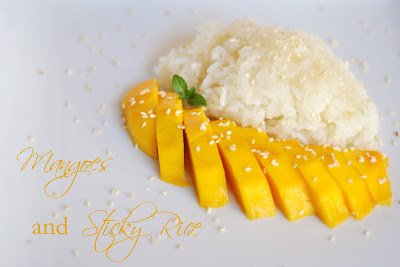 I've tried many different recipes for "mango sticky rice" over the years and I think I've finally found the easiest and best method! And here I'm happy to share it with you! find in Thailand was a good investment! Surprisingly you can purchase it used on Amazon if you so desire. 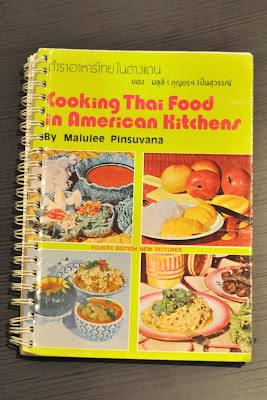 There are FANTASTIC recipes in there and they're all in Thai and English side by side. That makes it even better if you happen to be in a Thai market looking for a specific ingredient... match up the characters or ask the owner! The rest of my "recipe" however is based on many trials of cooking the rice and finding the fastest and easiest way is actually IN THE MICROWAVE! I know... there are folks out there appalled that I just said I'm going to cook rice in the microwave. And sure, it's probably not the BEST quality but it is pretty dang good when I'm in a hurry to fill my belly with some mango sticky rice! Wash rice and soak it covered in water for 10 minutes or up to a couple hours, in a microwave safe bowl. Drain the rice and refill with 1 cup of hot water. Cover the top loosely (I use a plate). Microwave on high for 3 minutes. Take it out and give it a stir and microwave again for 3 minutes. Always stir the rice between "zappings". I suppose your microwave time may vary depending on your wattage. Mine is a 1000 watt, 5 year-new Whirlpool. If your rice doesn't seem almost done or done at this point, just keep zapping it for additional 30 seconds to 1 minute until it is. Meanwhile, mix the 3 above ingredients together and make sure it's all dissolved before moving on. Pour 1/2-2/3 of the coconut milk syrup into the cooked rice and stir it up. It will be very liquidy (pic to the right) but that's perfectly fine. Zap it again for 2-3 minutes. Or try for 2 then do a final 1. By this point the rice should be cooked through. If it's not, keep zapping it for 1 minute at a time until it's cooked and the liquid is absorbed - keeping it loosely covered at all times. Let the rice sit for 5-10 minutes. I like to put mine in the fridge or freezer to attempt to cool it down some before serving. I peel my mangoes (with a paring knife, not a peeler!) first then cut basically how this guy does. 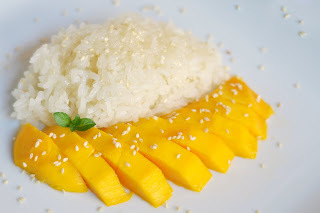 Put a scoop of rice next to or underneath your mango slices. If you'd like (I never have the patience, but it looks nice) you could cook down some of the leftover syrup until it thickens and pour it over the rice also. 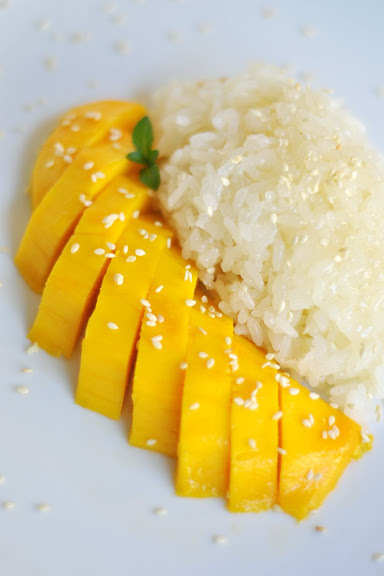 Then sprinkle with some toasted sesame seeds or fried mung beans... Mango Sticky Rice!!! OMG! You are HILARIOUS! I love how you put the Youtube link to "this guy" giving mango cutting instructions. I made this dessert tonight with your recipe. Yum! Thanks for inspiring me! I can't believe you actually MADE this. you are awesome. mango + rice + sugar = my fav foods. You inspired me in two ways...one was something new to do with mangos, and two was to check out the big ethnic grocery store in town. Excellent dessert...I have some leftovers for a snack today!